Resplendent above the azure waters of the breathtaking Cape Sani, the luxuriously renovated Sani Beach exists in harmony with the natural world around it. 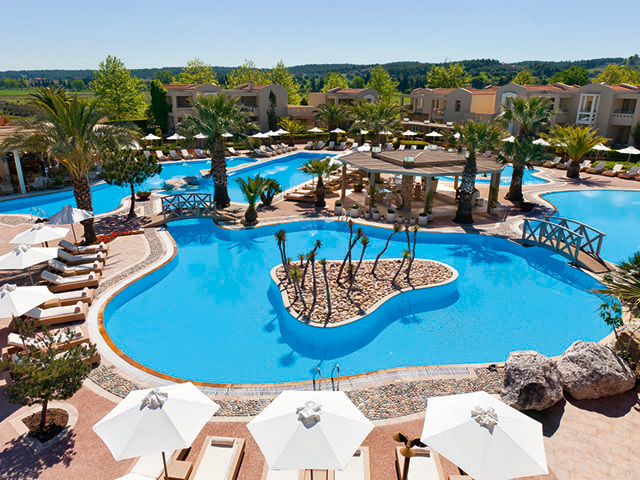 This spacious hotel promises a five star experience for all the family with its exclusive beaches and miles of golden sands, enticing spa and impressive restaurants with their choice of international and Greek cuisine. Occupying a prime position on the Cape, this warmly welcoming hotel offers an unparalleled choice of rooms, making it the perfect getaway for families of all sizes. Seize the opportunity to enjoy your favourite water sports, brush up on your game with our tennis coach or take off into the spectacular Mediterranean scenery on a mountain bike. Or with so much to entertain children of all ages, you may just be tempted to do absolutely nothing. 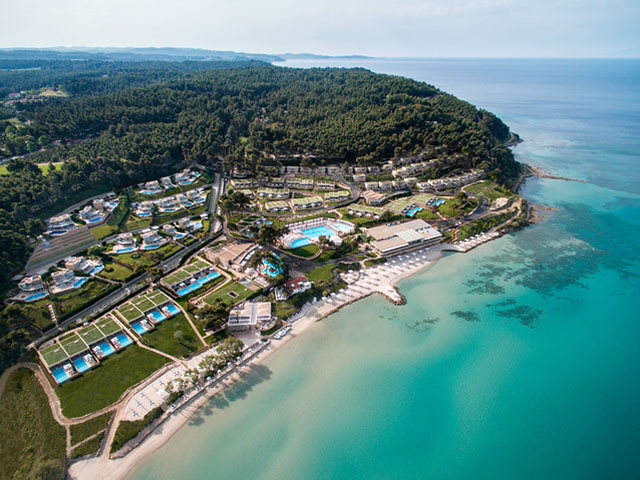 Offering superb comfort in a breathtaking position on the Cape of ancient Sani, next to the Byzantine tower, the Sani Beach Hotel enjoys a natural environment of exceptional beauty. 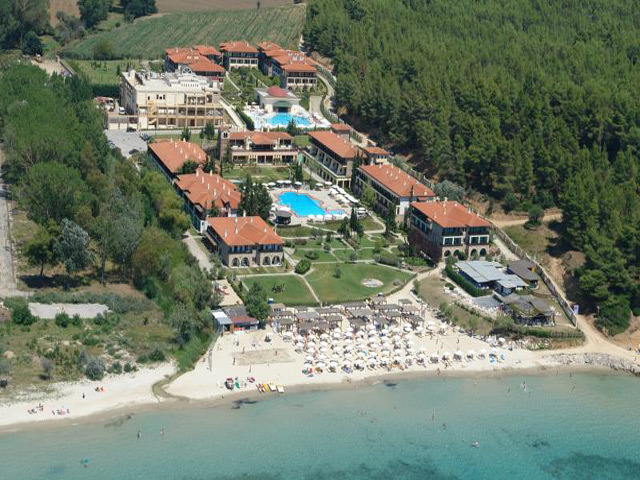 It offers wonderful views over the Aegean Sea and Mount Olympus, crystal clear waters and 7 km of golden sand, backed by extensive pinewoods. 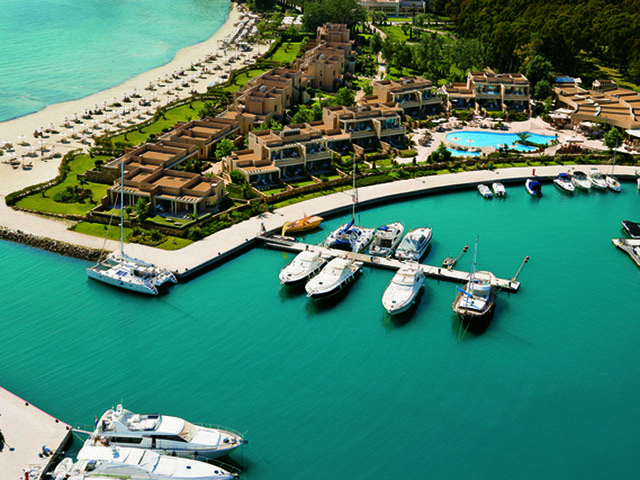 Sani Beach now offers its widest choice of rooms ever, from doubles to junior suites and one and two bedroom suites. The contemporary colonial styling is designed for total comfort and is complemented by chic furniture and floor to ceiling windows providing spectacular views across the Aegean and the beautifully landscaped gardens. It’s a spacious, relaxing environment with each room offering an exclusive terrace, balcony or private garden. Light and airy, the accommodation has everything you could want to make your stay a real pleasure. Double Room : The contemporary design and comfort of our air-conditioned 25m2 Double Rooms accommodate up to two adults. Junior Suite : The spacious contemporary style of our 35m2 Junior Suite is complemented by a seating corner that adds even more comfort and a private balcony with coffee table and chairs. Junior Suite Panorama : Our spacious 40m2 suites offer you luxury combined with the best views in the whole of Sani Resort. Family Room : Our 50m2 Family Room conveniently combines two doubles with an interconnecting door to comfortably accommodate up to four people. One Bedroom Family Suite : These beautifully spacious 50m2 suites provide a separate bedroom and living area to ensure a luxuriously comfortable stay. Two Bedroom Family Suite : This luxurious family suite comes with two beautifully spacious bedrooms, a separate living area and two bathrooms. One Bedroom Family Suite Beach Front : This spacious suite offers the highest levels of luxury throughout and direct access to the Sani Hill beach. The One Bedroom Family Suite Beach Front provides a separate bedroom and living area to ensure a luxuriously comfortable stay. Grill by the Pool - Saunter by at any time to enjoy the relaxed ambiance of Grill by the Pool. During the day, it’s the perfect shady spot for breakfast, lunch or an afternoon snack – with no need to stray far from the pool. When the sun sets and the stars come out, Grill by the Pool lives up to its name with premium steaks, homemade burgers and other succulent meats freshly grilled to order (in a way that only Greeks know how). Ammos Restaurant - A chic bar-restaurant where guests can try the finest Greek and international cuisine to the sounds of ethnic and pop music. Ammos is open for breakfast, lunch and dinner offering guests an intimate dining experience where all dishes are placed in the middle so that everyone can share. Bousoulas Beach Bar : After a hard morning on the beach you’ll love one of our club sandwiches or other favourites along with a great selection of refreshing drinks. It’s so relaxing here, you can even enjoy a massage before you eat. And in the evening it’s a vibrant bar in which to enjoy a sundowner and fantastic company. Poseidon Restaurant : An exciting culinary experience for all the family with themed buffets each evening offering a wide selection of hot and cold dishes to satisfy the biggest and smallest appetites. Open for breakfast, lunch and dinner. Ammos Bar : A beautiful beachfront bar-restaurant that serves the finest Greek and international cuisine for breakfast, lunch and dinner. Guests can also enjoy a cocktail in the evenings and listen to the in-house DJ. Bar By the Pool : All that splashing will make you hungry so grab a lunchtime snack by the pool with a refreshing choice of drinks too. And once the sun has set this is another vibrant spot in which to hang out and have fun. Zephyros Bar : Relax with an after dinner espresso or one of our classic cocktails perhaps, and watch the world go by in the chilled atmosphere of our lobby bar. Sports Bar : All that physical activity at the Sani Sports Centre is sure to make you thirsty, so grab a refreshing drink or an energy booster at our Sports Bar, located on the terrace next to the Mini Footbal court. Garden Theatre Bar : Offering Greek and international wines, premium beers and a selection of spirits, the Garden Theatre bar opens half an hour prior to performances, during and after the shows. Located just steps away from your theatre seat, it is the perfect place to meet friends before the show to enjoy a glass of sparkling wine or a cocktail.